Key difference: Samsung has now expanded its’ offerings in the phablet category by introducing the Samsung Galaxy Mega 5.8 and Samsung Galaxy Mega 6.3. The Samsung Galaxy Mega 6.3 is named such because of its 6.3 inch TFT capacitive touchscreen with a resolution of 720 x 1280 pixels. The phone is powered by a Dual-core 1.7 GHz Cortex-A15 processor with a 1.5 GB RAM. 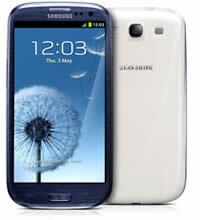 The Galaxy S3 is a slate-format multi-touch smartphone that was launched in May 2012. The S3 sports a 4.8 HD Super AMOLED screen with corning gorilla glass 2. 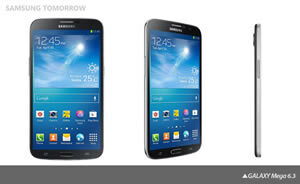 The S3 supports a 1.4 GHz Cortex-A9 Quad-core processor, Mali-400MP GPU and 1 GB RAM. The phone boasts an 8 megapixel Auto Focus camera with flash, zero shutter lag and BSI. It also supports a 1.9 megapixel secondary camera that is capable of recording HD videos @30fps. When the phone was initially launched in May, the phone was considered to have been backed with innovative features and the TouchWiz "Nature UX" GUI was considered to be advanced. The GUI also included the “Water Lux” effect which can produce water ripples on contact. The phone also offered S Voice in response to Apple’s Siri, which enabled users to verbally control 20 functions on the phone. It was effectively considered as an iPhone killer. It also received additional publicity because of the ongoing patent infringement lawsuits against Apple. The information for the detailed table about the two phones has been taken from the Samsung website, samsungmobilepress.com, samsungtomorrow.com, gdgt.com and GSMarena.com. 8 MP Auto Focus camera with Flash & Zero Shutter Lag, BSI.